On a Sunday night, a body plummets into the Hudson River. As soon as the man hits the water, dozens of faces press against the window panes on the lower level of the Circle Line Sightseeing Cruise, the boat from which the man leapt. Someone tosses a flotation device in his direction, and he freestyle-strokes to the pier where the boat is soon to dock. The boy-band O-Town pauses its meet-and-greet, looking confused as security rushes toward the exit. Ryan Cabrera quietly slips behind the pink shower curtain that separates the backstage area from the food counter. While the reasons for jumping overboard from a Ryan Cabrera and O-Town cruise were both unstated and yet immediately clear, the escapee was safely met on land and taken into custody. After the incident, the four current members of O-Town—Erik-Michael Estrada, Trevor Penick, Jacob Underwood, and Dan Miller—adjust their hats and tousle their hair nervously before continuing to greet fans. (Original vocalist Ashley Parker Angel declined to rejoin the band, instead pursuing a professional career on Broadway, and a shirtless one on Twitter.) In order to meet the band, O-Town diehards have purchased merchandise in addition to the $40 cruise ticket. Everyone else is instructed to deboard. Three hours prior, at the start of the Circle Line journey, I was popping store-brand, non-drowsy Dramamine hoping to keep my movie theater hot dog safely in my guts and anticipating one of the most nostalgia-fueled evenings of my life. In true showbiz fashion, O-Town and Cabrera put their MTV pedigrees to good use (O-Town was formed on Making The Band; Cabrera’s first TV appearance was on The Ashlee Simpson Show) aboard a sold-out boat of primarily 20- and 30-something women. Organized by concert cruise promoters Rocks Off, the event ignited the pleasure centers in our brains devoted to unrequited crushes, sugary pop melodies, and frosted tips. But for George Whalen, that fandom never ceased. 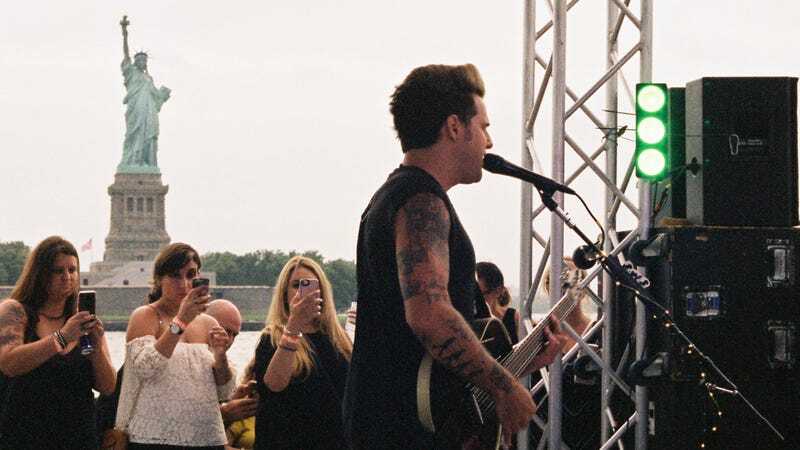 Dressed in a Boston Red Sox hat and a Ryan Cabrera tour t-shirt he purchased at Irving Plaza in 2005, Whalen was finally meeting his favorite musician. Whalen showed off the CD and soundcheck guitar pick Cabrera signed for him and I noticed his heavily tattooed arms. He doesn’t have any Cabrera-inspired ink, though without his music, he said, his life wouldn’t be the same. Cabrera’s hair still features icy highlights and his vocals are still as buoyantly boyish as they were over a decade ago. Performing a solo set of mostly requests, Cabrera took the opportunity to wax poetic about the good ol’ days, when 2006 single “I Will Remember You” was featured in a number of television shows including the series finale of Will & Grace. “The label didn’t like it,” Cabrera said of the song, though his mom did. He was also plugging a future project with Ryan Follese of pop-rock band Hot Chelle Rae, so Cabrera’s set didn’t feel contained in a time capsule, but was certainly defined by the distinct emotions in those mid-aughts singles. Fans sang along with youthful verve, their phones stuck in their faces. One of the more contradictory aspects of human physiology is simultaneous hunger and nausea. So in between sets I decided to try some of the boat’s food offerings, which included chicken sandwiches and macaroni salad, hot dogs (sold in pairs), nachos, and burgers. The chili nachos were topped with brown goop that came from a plastic bag; it was surprisingly delicious. My only regret is not diving face first into the macaroni salad while trying not to puke. “I appreciate that you get seasick,” Brandy Robidoux, a leather jacket-clad O-Town fan told me through dark sunglasses. She didn’t realize the show was on a boat until a few hours before boarding. She worried about queasiness too, but more importantly, she was concerned with O-Town’s ability to engage with the crowd. “They need to really deliver and play all the old hits and make the fans happy with the singles everyone misses,” she said. It was those singles, like “Liquid Dreams” and “All Or Nothing,” that brought the largest cheers, but O-Town’s newer work—including “Skydive” from their 2014 reunion album Lines & Circles, and club-ready songs from their 2017 EP (“Giants,” “Empty Space”)— felt more in line with contemporary tastes and audience energy. The crowd bobbed and weaved with the band—who managed to execute poised choreography despite the rocky nature of the venue—and sang along to every word. Still, it was the desire to meet the acts that was the most alluring to fans, as if the performances were secondary to the experience of marking it with a FOMO-inducing selfie. Alicia Charles and Daisy Hobbs wore tiaras, both celebrating their upcoming respective weddings. What would make the night worth the $40 pricetag, though? “Dancing all night with my girls,” Charles said. When selfies are capital, the desire to memorialize an experience you yearned for in your adolescence becomes imperative, the social fountain of youth. By meeting the artists (for some, not even for the first time), fans got to prove their adoration is real, and to vocalize the impact the music has had on their lives.